This is Quentin Taratino’s masterpiece extended with several missing scenes. Your deeper Pulp Fiction voyage. 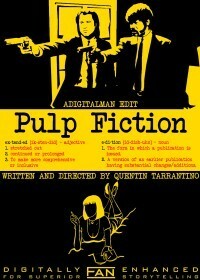 Deeper character development and more of Tarantino’s snappy dialogue. Explains Mia’s comment about Vincent being an “Elvis Man” too. 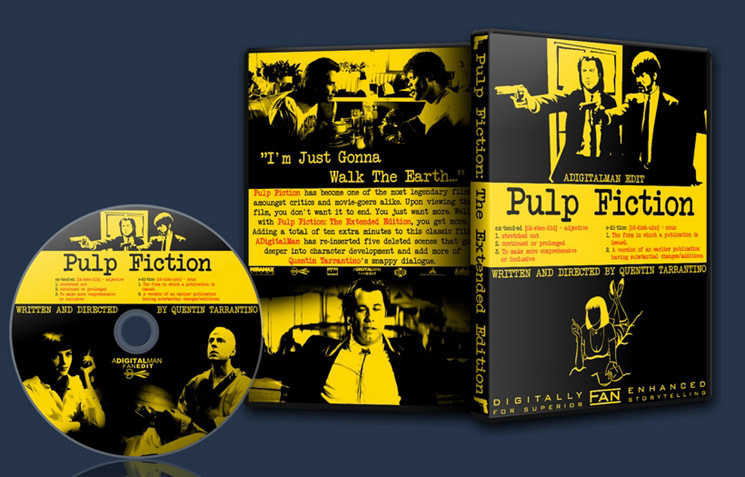 Being Pulp Fiction one of the best movies of the 90's, it was not one made for my tastes.While I enjoy other of Tarantino's films, this was one that I was never able to understood. Now, thanks to this fanedit, I get the sense of most of the things that happens in the story. It is a pitty that most of these added parts had a lower quality, but the rest is nearly perfect.